I wrote about this dish back when I was first blogging, but it's such a good, easy-to-make dish that it bears repeating. It's healthy and relatively inexpensive; in short, it's all good. Lentils, water, bulgur, onions and a little oil. Salt and pepper to taste, and that's it. 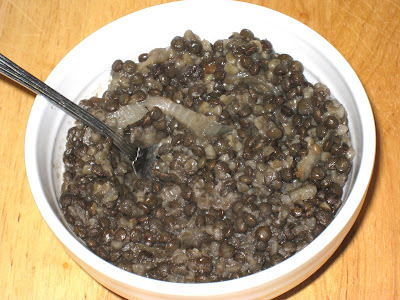 I especially like it with black, or beluga, lentils. They hold their shape best, and don't get mushy like the regular khaki-colored lentils I grew up eating. The bulgur adds a warm, toasty flavor and the caramelized onion punctuates each bite with sweet goodness. There's something about the combination of flavors that makes this an irresistable dish. Do yourself a favor and make up a batch. You'll see what I mean. Combine lentils and water in large saucepan and bring to a simmer over medium heat. Cook approximately 25 minutes then add wheat, salt and pepper. Cook 15 minutes more, until lentils are tender, stirring frequently. Add hot water if necessary. In another skillet, heat oil, add onion, and saute 7-10 minutes, until browned. Stir onions into lentil and bulgur mixture. Serve with tossed salad and hot pita bread.